Many common orthodontic “emergencies” can be handled easily at home. To help you accurately describe an emergency situation to the orthodontic staff, use the diagram at the end of this section, which illustrates and names each part of a typical set of braces. 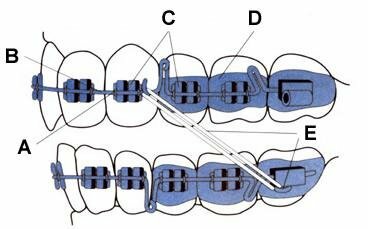 Brackets (see diagram) are the parts of braces attached to teeth with a special adhesive. They are generally positioned in the center of each tooth. If the bracket is off center and moves along the wire, the adhesive has likely failed. If the loose bracket has rotated on the wire and is sticking out, attempt to turn it back into its normal position and call our office to schedule an appointment to have it reattached. You may wish to put orthodontic wax around the area to minimize the movement of the loose brace. If you are in pain, please call our office and inform us of the circumstance. If you are not in pain, this is not a true emergency. Please call our office during business hours at your earliest convenience to schedule an appointment to reattach the brace to the tooth. If the end of an orthodontic archwire (see diagram) is poking in the back of the mouth, attempt to put wax over the area to protect the cheek. Call our office to schedule an appointment and have that clipped. Use a Q-tip or pencil eraser to push the wire (see diagram) so that it is flat against the tooth. If the wire cannot be moved into a comfortable position, cover it with relief wax. (See “Irritation of Cheeks or Lips” below for instructions on applying relief wax.) Make the office aware of the problem. Tiny rubber bands known as alastic ligatures (see diagram), are often used to hold the archwire into the bracket or brace. If an alastic ligature is lost, contact our office and we can advise you whether the patient should be seen. The band is the cemented ring of metal, which wraps around the tooth. If there is an orthodontic Emergency that requires Dr. Kaufman’s attention you can page Dr. Kaufman at 440-915-1194. Please leave your name, patient’s name, phone number and nature of the Emergency after the tone. Dr. Kaufman will promptly return your call.